Laser Phototherapy, Low Level Laser Therapy or cold laser is phototherapy involving the application of monochromatic and coherent light to injuries and lesions to stimulate the healing process. It is used to increase the speed, quality and tensile strength of tissue repair, decrease inflammation and decrease pain. Laser can treat many common disorders, acute or chronic, or can be used for acupuncture point stimulation. It can be used to treat muscle, tendon, ligament, connective tissue, bone and skin tissue. Laser can be used in rehabilitation for large and small animals, and for both performance and companion animals. It is used for treatment of animal athletes due to the shorter recovery and thus decreased time away from sport. It can even be used on competition days for performance animals. Laser is effective in treating: sprains and strains, wounds and abrasions, haematomas, ligament and tendon injuries, bowed tendon, acute and chronic inflammation, joint injuries, myofascial trigger points, pain points, deep-tissue and superficial acupuncture points, acute and chronic pain, non-union and small-bone fractures, mucous membranes, and post-surgical wounds. Low Level Lasers are handheld devices that are about the size of a flashlight. The laser is placed directly over the injured area for 20-180 seconds. Depending on the size of the injured area, the laser may have to be applied 2-6 times in one treatment to cover the injured area. During the treatment time, the non-thermal photons of light emitted from the laser pass through the layers of the skin penetrating to depths of 3-4cm depending on the wavelength used. Low Level Lasers have a photochemical effect similar to photosynthesis in plants. The light is absorbed by the cells and interacts with light sensitive areas, which increases intracellular metabolism and converts usable energy into normalizing damaged or injured tissue, reducing pain, inflammation and swelling, and decreasing healing time. The laser increases blood flow to the area increasing oxygenation and bringing cells to aid in the healing process. The increased blood flow also helps clear inflammatory cells, fluids and debris from the area. The frequency of treatment is based on the type and stage of the injury or the condition being treated and how often the animal can attend treatment. Usually during the acute phase of healing the treatment is more often, but during the chronic and rehabilitation phases the treatment frequency is decreased. There are only a couple of considerations of safety with laser treatment. Lasers are potentially harmful to the eye, but it is highly unlikely especially with the use of safety glasses. Also, there is a potential for discomfort or a minor burn at the site of treatment when used on dark-skinned or dark-haired animals. This is avoided with a change in the duty cycle of the probe to 50% reducing the average power of the light beam and minimizing the risk of minor burns or discomfort. 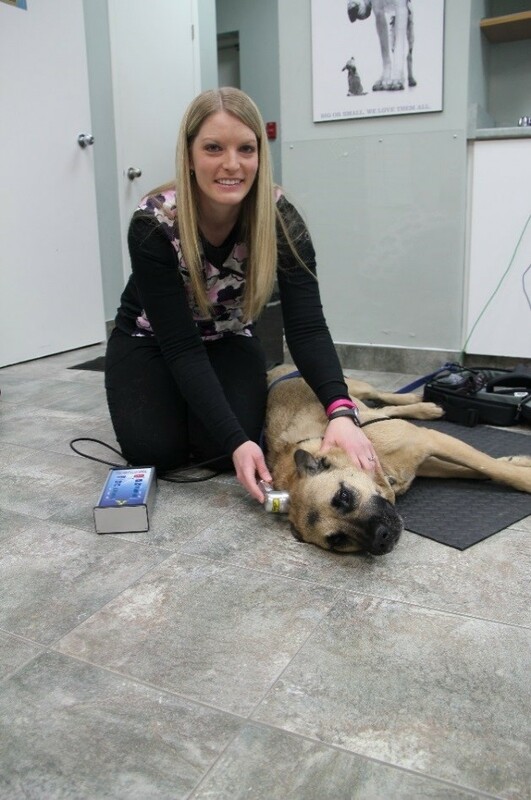 Laser is safe and non-invasive, offering quick relief from inflammation and pain, as well increase healing for both acute and chronic injuries for your competitive or companion animals. This entry was posted in Canine Rehabilitation, dogs and tagged canine, dogs, rehabilitation on September 22, 2015 by bodytechphysio.